Sea-surface temperature measurements are an essential component in the production of the average global temperature figures. Without data from the oceans we wouldn’t see 70 per cent of the world’s surface and we would get an unrepresentative picture of global change. But piecing together an accurate picture across the vast expanse of the world’s oceans and decades of time and technical changes is extremely challenging. Buoys, such as this one off the South Devon coast, are becoming increasingly important in measuring sea-surface temperature. Picture: Grahame Madge (Met Office). 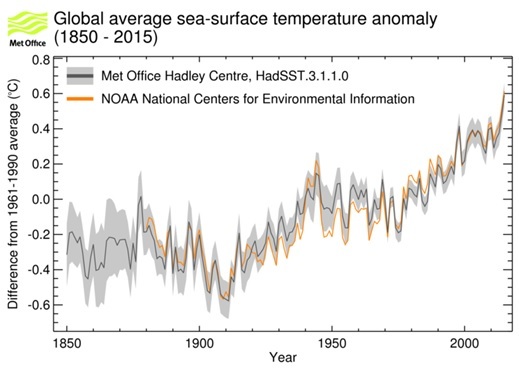 When putting together global temperatures, there are two main sea-surface temperature data sets: one, produced by the Met Office Hadley Centre, known as HadSST3; and another, produced by NOAA, known as ERSSTv4. A new scientific paper in the journal ScienceAdvances has drawn attention to small differences between these data sets, and between two of the National Oceanic and Atmospheric Administration’s data sets (ERSSTv4, and its earlier version ERSSTv3). The new study suggests there have been some small improvements to how the global rate of warming is represented in NOAA’s latest data set, which warms slightly faster in recent years. The difference between NOAA’s latest data set and the Met Office data set is estimated to be around 0.03 °C per decade over the period 1997-2015 in the global average. It is important to note that this study focuses on the global average. Figure 1 shows the differences between the two data sets in the context of long-term global sea-surface temperature change. The level of the discrepancies discussed, though evident at the global scale, are small compared to regional variations in temperature (Figure 2), and small when compared to longer-term changes in the global average. Figure 1: differences between the NOAA and Met Office Hadley Centre data sets in the context of long-term global sea-surface temperature change. It is important to note there is variability in global temperatures such that trends, for example over 15-year time periods, slow down and speed up, as part of the longer term global warming trend seen over the last century. Buoys provide more consistent sea-surface temperature measurements than ships. The design of drifting buoys was standardised in the 1990s and in many studies they have been shown to make more accurate measurements, at least on average. 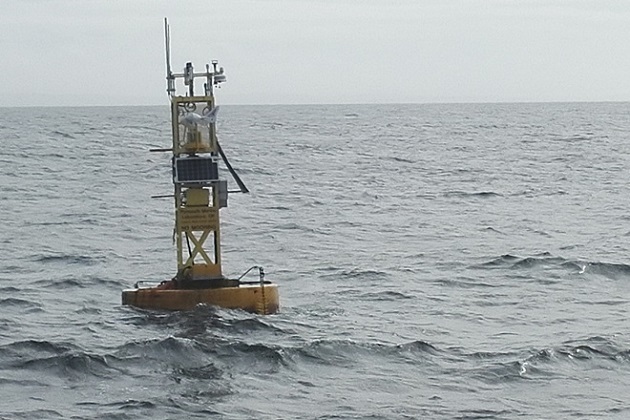 The number of measurements from buoys has increased massively over the past 30 years, and they now form the greater part of the surface-monitoring network for sea-surface temperatures over the oceans. It is possible to make accurate measurements in these ways but, on average, the measurements being recorded had been found to be a bit warmer than the true sea-surface temperature. Scientists managing the different data sets have applied adjustments to the data to account for these kinds of changes. However, the approaches they take are quite different and give slightly different results. One key difference is that the team working on NOAA’s latest data set have applied an adjustment to the ship data which accounts for the cooling seen in the data since the early 2000s. 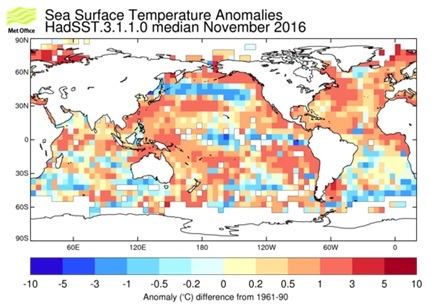 Figure 2: regional variations in sea-surface temperature recorded by the Met Office Hadley Centre HadSST3 data set for November 2016. This new study uses a number of shorter data sets. Each of these is based on measurements made purely from a single type of instrument, avoiding dealing with a changing mix of measurements. They look particularly at instruments, such as Argo floats – which give high-quality measurements – and satellite datasets that are somewhat independent of the surface networks. By comparing these to the different global sea-surface temperature data sets, they provide independent confirmation that the adjustments applied in NOAA’s latest data set have led to a more accurate estimate of global sea-surface temperature change over the past 20 years. This entry was posted in Met Office News and tagged climate, climate science, global temperature record, Met Office, Met Office Hadley Centre, sea surface temperatures. Bookmark the permalink. I have to ask; where were you getting your sea-surface temperature data in 1850? A very sneaky way of getting rid of the pause and upping the rate the globe is warming at in one fell swoop. You might delete this comment but it won’t stop me.